Before you enjoy a helicopter ride over the Grand Cayon, relax with iPads and wifi during a 25-minute van ride from Las Vegas to Boulder City. From there, experience the majestic beauty of the Grand Canyon from high in the air, on a a scenic helicopter flight to the West Rim. Your air-conditioned helicopter grants you an aerial view of the canyon’s iconic curves and multihued landscape, plus Lake Mead and Hoover Dam en route. A spectacular sight from the sky, Hoover Dam snakes through the rock canyon walls, cutting its way into the landscape. Choose to upgrade to a sunset flight, and watch the rocks change colors as the sun sets over the canyon. During the flight, you can relax and listen to your pilot's commentary about the Grand Canyon and its surroundings via audio headphones. 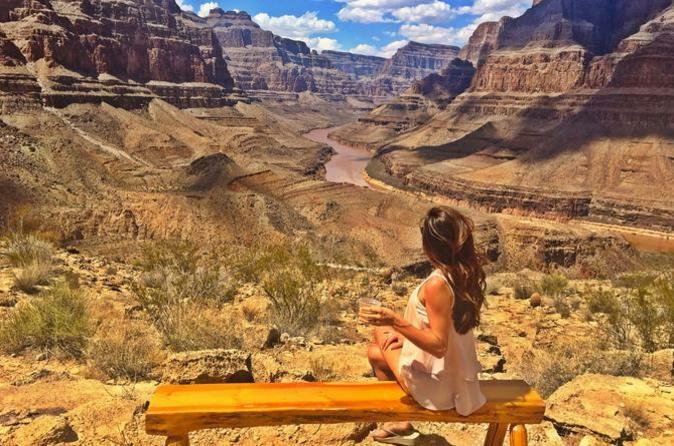 Once you pass over the terra cotta–hued landscape, you’ll descend and land 3,200 feet (960 meters) below the Grand Canyon’s rim for a Champagne picnic. Pop the bubbly and take in the sights from inside the canyon, with your pilot/guide nearby to answer any and all questions about the natural wonder or your helicopter flight. After your picnic, catch one last sky-high peek at the Grand Canyon on your 35-minute return helicopter flight. Your trip will end at Boulder City Airport where you'll be returned to your Las Vegas hotel. Special Offer - Book with us and save 23% compared to the local operator's price for Sunday travel, between 16% and 20% on daytime departure or 5% on any sunset flight! - Book Now!